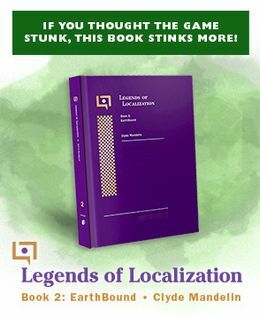 If you frequent this site, then you probably know Onion, one of the awesome and serious collectors who manages to find all kinds of cool stuff. Well, he’s looking to lighten his collection a little bit to get some money, so if you’re into EarthBound/MOTHER merch, he’s got some stuff you might be interested in! Now this is a collectors item for sure – only 200 were given out, and you won them by winning a bunch of Japanese crane game figures, jumping through a bunch of hoops, and then entering a drawing. More info here. Needless to say these are really hard to come by, especially outside of Japan. 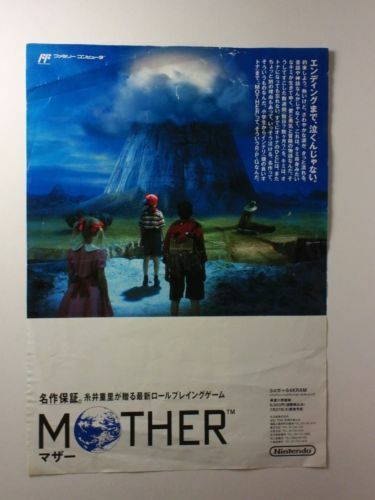 This was promotional material used to advertise the first MOTHER game. I don’t see this very often, definitely worth grabbing if you’re more of a historical (or hysterical) collector. So buy some stuff, get some cool rare merch of your own, and help out a fellow fan! And then Onion can finally build his Super Onion Machine. I would go for the stickers, but then I would use them and then they’d be lost forever, never to see another collector. Kinda like my manga. But probably not as bad. You could frame the stickers… I couldn’t even think of putting them on any object. Any chance whoever ends up with that flier could carefully get a scan of it? That’s the cleanest, least-cluttered version of that famous Mt. Itoi artwork I’ve seen. O_O thats some great stuff for sale, I’ll be keeping my eyes on the poster and stickers. I wonder what would happen… if you put the stickers ON THE POSTER!??!?!?!? I now know your plan to take EarthBound 64! There’s even cooler swag up for auction right now(on Yahoo! 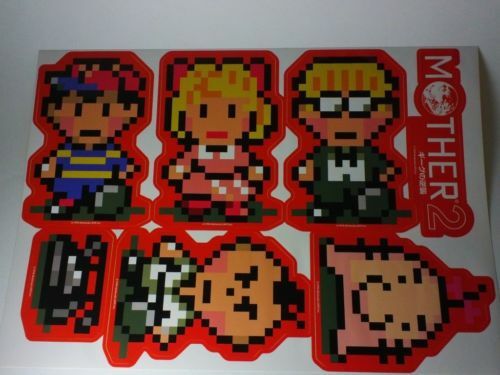 Japan): MOTHER 1+2 FROM THE LAUNCH EVENT SIGNED BY ITOI 😮 It even includes the ticket and a mini Mr. Saturn! Ahhh, that’s not actually a poster. It’s a flyer on size A4 paper. I edited the description to reflect that. Sorry for any confusion. @Poe – Yeah, I’ve got these but…not for too much longer I hope 😀 I love them but am trying to prune my collection down to the bare minimum and raise some money for life-related stuff in the process. @Yosh – Sorry mate, but I have had my fair share of troubles with international sales. Looks like some cook stuff. I sure hope you are getting rid of it because you don’t need it and want other EB fans to enjoy it (as opposed to because you needed money). 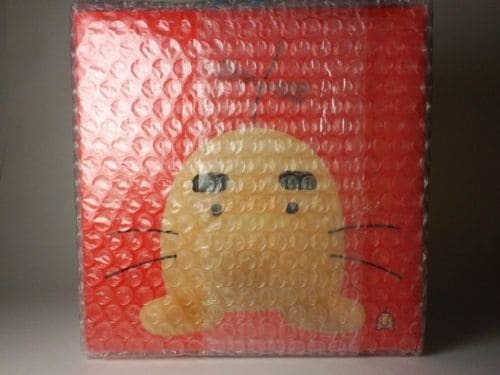 Now if only there were more Mr.Saturn plushes…..